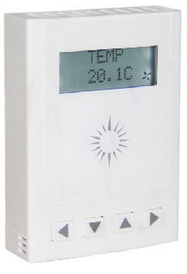 Outside air temperature can be used to determine permission of the relays when triggered. Perfect to prevent air exchanger to work in very hot or very cold weather. Inside air temperature sensor can be used to to evacuate when room is too hot, even if motion sensor is not triggered. Programmable delay function to run from 5 to 45 minutes per hours.